Home › Eurasian buzzard › Long-legged buzzard - Buteo rufinus. The long-legged buzzard (Buteo rufinus) belongs to the family Accipitridae. These long-legged buzzard species are distributed in Europe, Asia, Indian subcontinent and Africa. Buteo rufinus was earlier included in the genus Falco. The two recognized subspecies are: B. r. rufinus (Cretzschmar, 1829) and B. r. cirtensis (J. Levaillant, 1850). The long-legged buzzard is a medium sized bird of prey, measuring 50 to 65 cm in length and weighing 600 to 1,300 grams. The female buzzard is larger and weighs 900 to 1700 grams. The wingspan is 125 to 155 cm. These bird species are polymorphic, plumage varying in color from dark brown to reddish to pale brown. They have orange tinge to their plumage, reddish orange tail and pale head. The underwings appear whitish. There is usually a distinctive black carpal patch. The trailing edge to the wing is blackish. They have long wings and legs. The buzzard call is a loud mewing, screaming sound. The long-legged buzzard inhabits various habitats like steppe, open country, semi-desert regions, rocky areas and forests with clearings. The long-legged buzzard preys on small mammals, especially rodents. It also feeds on lizards, snakes, small birds and large insects. The long-legged buzzard breeding season is during March and April. It nests on high bushes, trees, cliffs or hillocks. The nest is built with sticks and twigs. The long-legged buzzard subspecies B. r. cirtensis is distributed in northern Africa, including Mauritania, Tunisia and Egypt. Small populations are also found in Middle East, Spain and Italy. The buzzard subspecies B. r. rufinus is distributed in southeastern Europe, Turkey, Northeast Africa, Israel, Middle East, Iran, Afghanistan, Central Asian nations, northwest China, Pakistan, north India and Bangladesh. The long-legged buzzard populations in north Africa are sedentary. The European and Asian buzzard populations migrate southwards to Africa, southern Asia and Indian subcontinent during August and September and return in March and April. The long-legged buzzard global population is estimated at 100,000 individual birds. These buzzard species have an extremely large range and population and are considered least vulnerable. Wind energy installations, pesticide use, depletion of prey and habitat loss are the main threats to the survival of these bird species. The IUCN (International Union for Conservation of Nature) has categorized and evaluated these buzzard species and has listed them as of "Least Concern". Current topic in Birds of India: Long-legged buzzard - Buteo rufinus. Home › White-eyed buzzard › Eurasian buzzard - Buteo buteo. The Eurasian buzzard (Buteo buteo) belongs to the family Accipitridae. 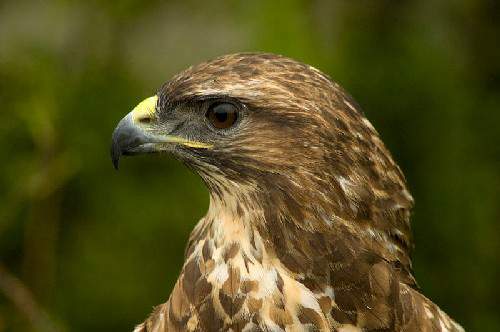 These Eurasian buzzard species are distributed in Europe, Asia, Indian subcontinent and Africa. Buteo buteo was earlier included in the genus Falco. Earlier it was also clubbed with B. japonicus and B. refectus. The nine recognized subspecies are: B. b. rothschildi Swann, 1919, B. b. harterti Swann, 1919, B. b. insularum Floericke, 1903, B. b. buteo (Linnaeus, 1758), B. b. arrigonii Picchi, 1903, B. b. pojana (Savi, 1831), B. b. bannermani Swann, 1919, B. b. vulpinus (Gloger, 1833) and B. b. menetriesi Bogdanov, 1879. The Eurasian buzzard is a medium sized bird of prey, measuring 40 to 50 cm in length and weighing 400 to 1,200 grams. The female buzzard is a larger bird and weighs 500 to 1,300 grams. The wingspan is 110 to 140 cm. The plumage varies from white to black in the subspecies. The more common plumage is shades of brown, with a pale 'necklace' of feathers. The flight feathers are barred and there is pale area in the outer primaries. The buzzard call is a loud mewing sound. These buzzard species inhabit edges of forests, pastures, open fields, steppe, coniferous forests, deciduous forests, wetlands and cultivated lands with closeby tree cover. The Eurasian buzzard preys upon small birds, mammals, frogs, reptiles and large insects. In rare occasions it is seen scavenging dead animals. The Eurasian buzzard breeding season varies with latitude and is generally from March to May. Nest is built with sticks and twigs on a tree branch. The clutch may contain 2 to 4 eggs. The incubation of eggs is mostly by the female buzzard. The male feeds the female and the chicks. 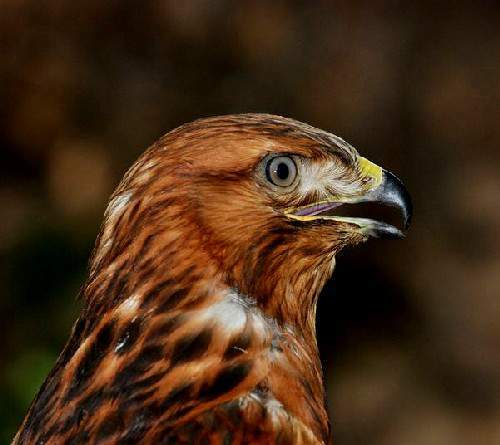 The Eurasian buzzard is distributed in Europe, Asia, India and Africa. The Eurasian buzzard is mostly resident. The subspecies B. b. vulpinus is completely migratory, migrating from northern Europe and Asia to winter in southern Europe, Africa and India. The Eurasian buzzard has an extremely large range and population and is considered least vulnerable. Persecution, bait traps, pesticides, decline is prey animals and habitat loss are the main threats to survival of these bird species. Current topic in Birds of India: Eurasian buzzard - Buteo buteo. Home › Eurasian sparrowhawk › White-eyed buzzard - Butastur teesa. The white-eyed buzzard (Butastur teesa) belongs to the family Accipitridae. These white-eyed buzzard species are distributed in West Asia, Indian subcontinent and Myanmar. Butastur teesa was earlier included in the genus Circus. It is closely related to B. rufipennis, B. liventer and B. indicus. The white-eyed buzzard is a medium sized bird of prey, measuring 35 to 45 cm in length and weighing 350 grams. The wingspan is 85 to 100 cm. The female buzzard is slightly larger than the male. It is slim bodied and has whitish iris and throat. The ceres are distinctly yellow and and there is a dark mesial stripe. The head and back are dark and the underside of the body is darkly barred. When perched, the wing tip nearly reaches the tip of the tail. On the rufous tail there is a darker subterminal band. The wings appear narrow and the tips of the wing feathers is dark. The buzzard call is a mewing sound. The white-eyed buzzard inhabits dry open land, open forest and cultivated lands. The white-eyed buzzard preys on small birds, mammals, reptiles, frogs, crabs and insects like locusts, grasshoppers and crickets. The white-eyed buzzard breeding season is from February to June. The nest is built on a tree with twigs and both the parents take part in nest building. The nest may contain up to three eggs. The female buzzard alone incubates the eggs. These buzzard species are distributed in India, Iran, Pakistan, Nepal, Bangladesh and Myanmar. They are summer visitor in northeastern Afghanistan. They may go up to 1200m in the foothills of the Himalayas. The white-eyed buzzard are resident birds in their range. They may move down from higher elevations in winter. In northeastern Afghanistan, they are summer visitors. The white-eyed buzzard has an extremely large range and population and hence it considered not vulnerable. The habitat loss and fluctuations in prey populations are the main threats to survival of these species of birds. 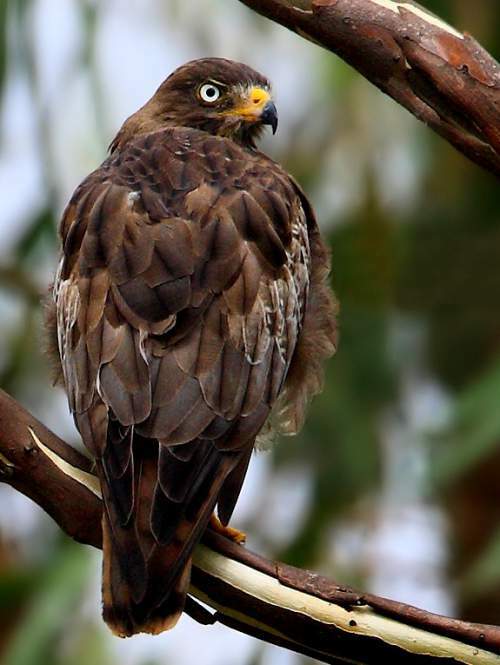 Current topic in Birds of India: White-eyed buzzard - Butastur teesa. Home › Northern goshawk › Eurasian sparrowhawk - Accipiter nisus. The Eurasian sparrowhawk (Accipiter nisus) belongs to the family Accipitridae. These Eurasian sparrowhawk species are distributed in Europe, Asia, Indian subcontinent and Africa. Accipiter nisus was earlier included in the genus Falco. It is closely related to A. rufiventris, A. striatus and A. ovampensis. The six recognized subspecies are: A. n. nisus (Linnaeus, 1758), A. n. nisosimilis (Tickell, 1833), A. n. melaschistos A. O. Hume, 1869, A. n. wolterstorffi O. Kleinschmidt, 1901, A. n. granti Sharpe, 1890 and A. n. punicus Erlanger, 1897. The Eurasian sparrowhawk is a small bird of prey, measuring 30 to 40 cm and weighing 100 to 200 grams. The female sparrowhawk is much larger than male and weighs 180 to 350 grams. The wingspan is 60 to 80 cm. Adult males have bluish grey upper parts, reddish cheeks and flanks and orange-barred underparts. The females and juveniles are brown above with brown barring below. The iris are yellow in immature males and are orange-yellow or orange-red in adult sparrowhawks. Their call is a a series of "kek-kek" sounds. The Eurasian sparrowhawk inhabit the edges of wooded areas and forests interspersed with open areas. The migrant sparrowhawks can be seen in any habitat, including urban areas and cities. The Eurasian sparrowhawk feed on birds and small mammals. It hunts by surprise attack from a perch. The Eurasian sparrowhawk breeding season is from April to June. The nest is built on a tree in the lower canopy with twigs, mostly by the male. The nest is lined with small twigs. Usually a clutch of four or five eggs is laid. The females incubates the eggs and the male sparrowhawk hunts and feeds the female and chicks. The Eurasian sparrowhawk are distributed in Europe, Asia, Indian subcontinent and Africa. The northernmost populations may move southwards during July and November, returning between March and June. The birds further south in Asia and Africa tend to be resident or dispersive. The Eurasian sparrowhawk global population is estimated to number more than 1,500,000 individual birds. These species of sparrowhawks have an extremely large range and population and are considered least vulnerable. Widespread persecution, use of harmful organochlorine pesticides, trapping by falconers, wind energy farms and habitat loss are the major threats for the survival of these species of birds. 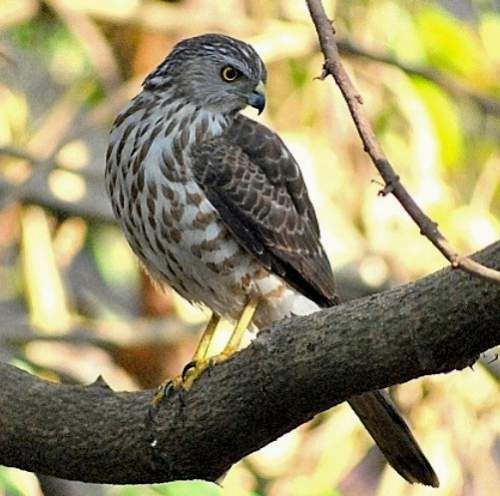 The IUCN (International Union for Conservation of Nature) has categorized and evaluated these sparrowhawk species and has listed them as of "Least Concern". Current topic in Birds of India: Eurasian sparrowhawk - Accipiter nisus. Home › Besra › Northern goshawk - Accipiter gentilis. The northern goshawk (Accipiter gentilis) belongs to the family Accipitridae. These northern goshawk species are distributed in North America, Asia and Europe. Accipiter gentilis was earlier included in the genus Falco. It is closely related to A. henstii and A. melanoleucus. The ten recognized subspecies are: A. g. buteoides (Menzbier, 1882), A. g. albidus (Menzbier, 1882), A. g. gentilis (Linnaeus, 1758), A. g. schvedowi (Menzbier, 1882), A. g. fujiyamae (Swann & E. J. O. Hartert, 1923), A. g. arrigonii (Kleinschmidt, 1903), A. g. marginatus Piller & Mitterpacher, 1783, A. g. atricapillus (A. Wilson, 1812), A. g. laingi (Taverner, 1940) and A. g. apache van Rossem, 1938. The northern goshawk is a medium sized bird of prey, measuring 45 to 65 cm in length and weighing 500 to 1,100 grams. The female goshawk is slightly larger and weighs 800 to 2,200 grams. These birds have short, broad wings and long tail. They are blue-grey above and are grey or white below. The chest and belly are barred. Adult goshawk have a white eye stripe. There are minor variations among the goshawk subspecies in eye color and level of grey or white coloration. Their call is a loud "kek-kek-kek" sound. The northern goshawk species inhabit mature, deciduous and coniferous forests, preferring areas near clearings and the forest edge. 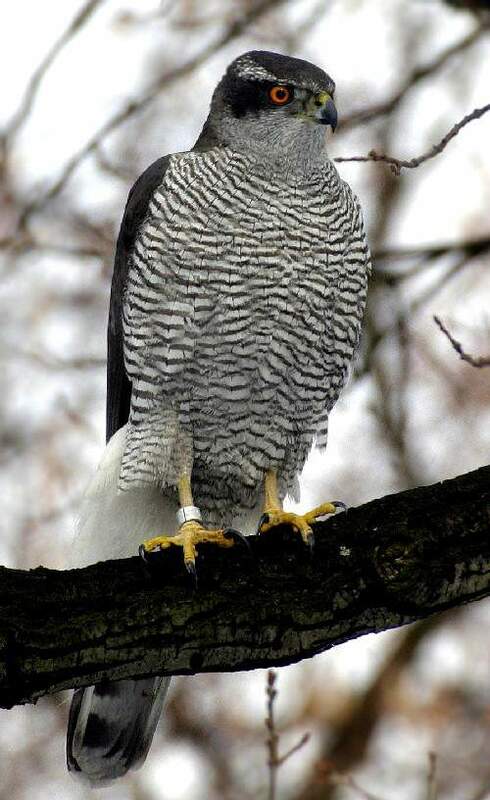 The northern goshawk prey upon birds, small mammals and reptiles. They surprise the prey by diving and attacking the prey. The northern goshawk breeding season is from early April to early June. A breeding pair will mate for life. The nest is built on a large, old tree. The nest is built with twigs and is lined with leafy twigs. A clutch may have up to five eggs. The female goshawk incubates the eggs and the male hunts and feeds the female and the chicks. The northern goshawk is distributed in the temperate parts of the Northern Hemisphere including North America, Europe and Asia. The northern goshawks are mostly sedentary in their habitats. The northernmost populations may move southwards during September and November and return in March and April. The northern goshawk global population is estimated to number more than 500,000 individual birds. These species of goshawks have an extremely large range and population and are considered least vulnerable. Persecution, deforestation, poisoning from pesticides and habitat loss are the main threat to the survival of these species. The IUCN (International Union for Conservation of Nature) has categorized and evaluated these goshawk species and has listed them as of "Least Concern". Current topic in Birds of India: Northern goshawk - Accipiter gentilis. Home › Japanese sparrowhawk › Besra - Accipiter virgatus. The besra (Accipiter virgatus) belongs to the family Accipitridae. These besra species are distributed in Indian subcontinent, Southeast Asia and East Asia. Accipiter virgatus was earlier included in the genus Falco. It is closely related to A. gularis and A. fasciatus. The eleven recognized subspecies are: A. v. kashmiriensis Whistler, 1936, A. v. affinis Hodgson, 1836, A. v. fuscipectus Mees, 1970, A. v. besra Jerdon, 1839, A. v. abdulalii Mees, 1981, A. v. confusus E. J. O. Hartert, 1910, A. v. quagga Parkes, 1973, A. v. rufotibialis Sharpe, 1887, A. v. vanbemmeli Voous, 1950, A. v. virgatus (Temminck, 1822) and A. v. quinquefasciatus Mees, 1984. The besra is a small bird of prey, measuring 25 to 35 cm in length and weighing 80 to 140 grams. The female is slightly larger and weighs 130 to 210 grams. The besra has short broad wings and a long tail. The underwings are barred. The upper parts of male are dark blue-grey and the underparts are whitish with reddish barring. The female is dark brown on the upper parts. The call is a loud 'ki-we' sound. These species inhabit deciduous and evergreen forests, dense forests, savannah and cultivated lands. The besra feeds on large insects, small birds, mammals, reptiles and frogs. The besra breeding season changes with the range and in the north India it is from March to June. They build nest in trees and the clutch is 2 to 5 eggs. The besra species are distributed in India, Pakistan, Nepal, central and south China, Southeast Asia, Indonesia and Philippines. The besra is a sedentary resident bird. The birds in Nepal and Himalayas may move southwards in winter. The besra global population is estimated to number 100,000 individual birds. These species have large range and population and are hence considered least vulnerable. The habitat loss due human activities is the main threat for the survival of these species of birds. Current topic in Birds of India: Besra - Accipiter virgatus. Home › Chinese sparrowhawk › Japanese sparrowhawk - Accipiter gularis. The Japanese sparrowhawk (Accipiter gularis) belongs to the family Accipitridae. These Japanese sparrowhawk species are distributed in Russia, China, Japan, eastern India, Indonesia, Philippines and Southeast Asia. Accipiter gularis was earlier included in the genus Astur. It is closely related to A. virgatus, A. fasciatus and A. cirrocephalus. The three recognized subspecies are: A. g. sibiricus Stepanyan, 1959, A. g. gularis (Temminck & Schlegel, 1844) and A. g. iwasakii Mishima, 1962. The Japanese sparrowhawk is a small bird of prey, measuring 20 to 30 cm in length and weighing 80 to 140 grams. The female sparrowhawk is larger than the male and weighs 110 to 190 grams. The wingspan is 45 to 60 cm. The male has dark grey upper parts. In males, the underwings are dark and barred and the underparts are lightly barred. 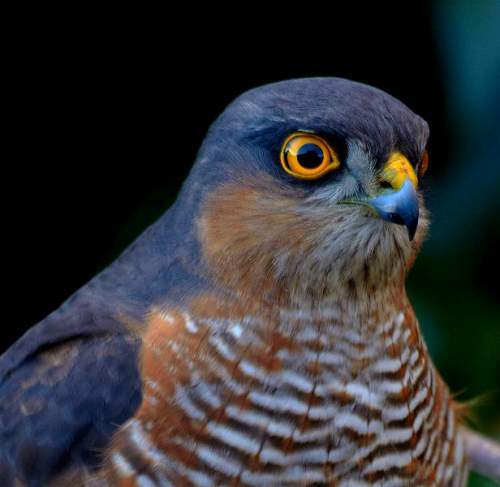 The sparrowhawk eyes are red in males and yellow in females. The call is a “kik-kik-kik” and a mewing sound. The Japanese sparrowhawk inhabits different types of forests and open lands with trees. The Japanese sparrowhawk feeds on small birds, mostly small forest passerines, taken in flight. These Japanese sparrowhawk species breed during May-June. The nest is built on trees with twigs. The sparrowhawk subspecies A. g. sibiricus is distributed in Russia, Mongolia, China, Japan and Southeast Asia. The subspecies A. g. gularis is distributed in Russia, Korea, China, Japan, Philippines and Indonesia. It is a occasional visitor to India. The subspecies A. g. iwasakii is distributed in South Ryukyu Island. The Japanese sparrowhawk subspecies A. g. iwasakii are sedentary. The other subspecies are migratory and winter in Indonesia, Philippines, Southeast Asia and occasionally in eastern India. The Japanese sparrowhawk population is estimated to number in the tens of thousands. These species of birds have an extremely large range and are considered least vulnerable. The loss of habitat in the breeding grounds is the main threat to the survival of these species of birds. Current topic in Birds of India: Japanese sparrowhawk - Accipiter gularis. 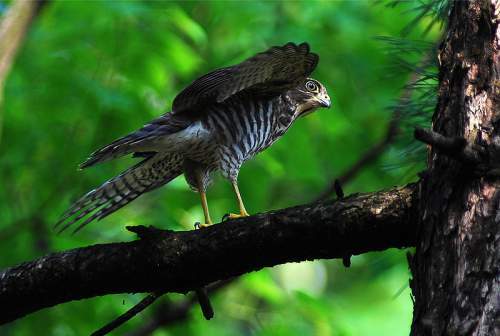 Home › Nicobar sparrowhawk › Chinese sparrowhawk - Accipiter soloensis. The Chinese sparrowhawk (Accipiter soloensis) belongs to the family Accipitridae. These Chinese sparrowhawk species are distributed in Russia, China, Taiwan, Indian subcontinent, Indonesia, Philippines and Southeast Asia. Accipiter soloensis was earlier included in the genus Falco. It is closely related to A. francesiae. The Chinese sparrowhawk is a small bird of prey, measuring 25 to 35 cm. The male weighs 140 grams. The female is slightly larger and weighs 200 grams. The wingspan is 50 to 60 cm. Adult has prominent black wing tips. The male is grey above and white below. The male sparrowhawk has red eyes and the female has yellow eyes. Their call is a sharp keee-keee-keee sound. These sparrowhawk species inhabit forests, open woodland, open country with trees, plantations and ricefields. These bird species feed on frogs, lizards and large insects. The sparrowhawk breeding season is from early May to August. The nest platform is built on the fork of a tree and the clutch size is 2-5 eggs. These sparrowhawk species are distributed in Russia, China, Taiwan, Indian subcontinent, Indonesia, Philippines and Southeast Asia. These sparrowhawk species are completely migratory. They breed in Southeast China, Taiwan, Korea and Russian Siberia. They pass through Southeast Asia and winter in Indonesia and Philippines. They occasionally visit Indian subcontinent. The Chinese sparrowhawk species has wide range and the population is considered least vulnerable. Habitat loss is the main threat to the survival of these species. Current topic in Birds of India: Chinese sparrowhawk - Accipiter soloensis.